In Part 1 of this three part series ‘Developing an IT strategy’ we talked about the benefits of having an IT strategy and why aligning it with your business development plan is an important step. In Part 2 we discussed how to get started and getting it right the first time round. 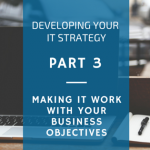 In the final of this 3 part series, we discuss how to integrate your IT strategy with your business plan to make it work with you towards your objectives and not become a barrier. So without further ado here’s how you could benefit from merging IT more succinctly with your business objectives, and be sure to include these points in your IT strategy. Know your IT estate: get more detailed about your assets register by having a separate one for IT, and include exactly how many assets you have, what they are, their technical attributes, their basic functionality, who creates, services or provides them, their life expectancy or licensing turnover, who uses them, who owns them, and when they are due for renewal. Understand your IT’s functionality: this is more relevant to software than hardware, where you need to understand the role the technology performs and the benefits it provides to your business. If you don’t know, find out, or declare it surplus. You might have subscribed to a trial of online software two years ago and you’re still paying for it but not using it properly, or its functionality has been replaced by something else. Review your business objectives: identify how IT contributes towards achieving these or how your IT needs to change to move you closer to these goals. Take action: decide what actions or processes need to be put in place to make what you identified in ‘step 3’ happen. Get action plans in place early in the year to reap the benefits faster. Review and repeat: business and IT strategy alignment should be revisited at least once a year to ensure they continue to stay in sync and so your IT doesn’t end up as just another tacked-on business function. Consider how you might measure this or what it might look like when you’ve reached the potential of what your IT can do for your business. Whether it’s an in-depth strategy, a brief outline, or some short answers to the questions listed in Part 2, you will have made valuable progress. At the very least you’ll have a sense of what needs to be done this year to start applying a modern mind-set to technology, which could help pre-empt potentially costly and time-wasting issues and, more importantly, advance your business objectives.